Just taking at the data as presented turns it into somethign of an infographic design exercise (I wonder if anyone will submit entries using infogr.am?!) but the reality is much more that it needs to be a real-time telemetry dashboard. Had I had time, I think I’d have extended this to include historical traces of some of the data, eg using something like the highcharts dynamic demo that could stream a recent history of particular values, perhaps taking inspiration too from Making Sense of Squiggly Lines. One thing I did think might be handy in this context were “sample and hold” colour digit or background alerts which would retain a transient change for a second or two – for example, recording that the steering wheel had been given a quick left-right – that could direct attention to the historical trace if the original incident was missed or needed clarification. The positioning RPM then throttle is based on the idea that the throttle is a request for revs. 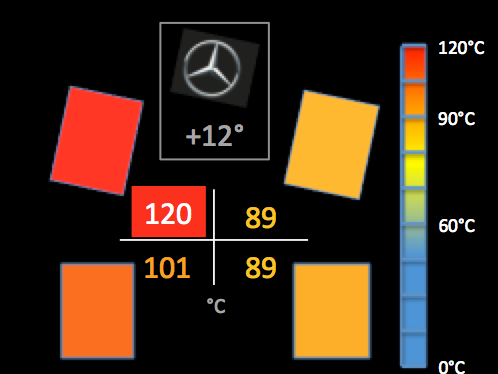 Putting throttle (racing green for go) and brake (red for stop) next to each other allows control commands to be compared, and putting brake and speed (Mercedes silver/grey – these machines are built for speed) next to each other is based on the idea you brake to retard the vehicle (i.e. slow it down). (I also considered the idea of the speed indicator as a vertical bar close to the gear indicator, but felt that if the bars are rapidly changing, which they are likely to do, it could be quite jarring if vertical bars are going up and down t right angles to each other? What I hope the current view would do is show more of a ratchet effect across all the bars?) The gear indicator helps group these four indicators together. (I think that white background should actually be yellow?) In the event of a gear being lost, the colour of that gear number could fade further in grey towards black. A dot to the right of the scale could also indicate the ideal gear to be in at any particular point. The tyre display groups the tyres and indicates steering angle as well as tyre temperature colour coded according to a spectrum colour scale. (The rev counter is also colour coded.) 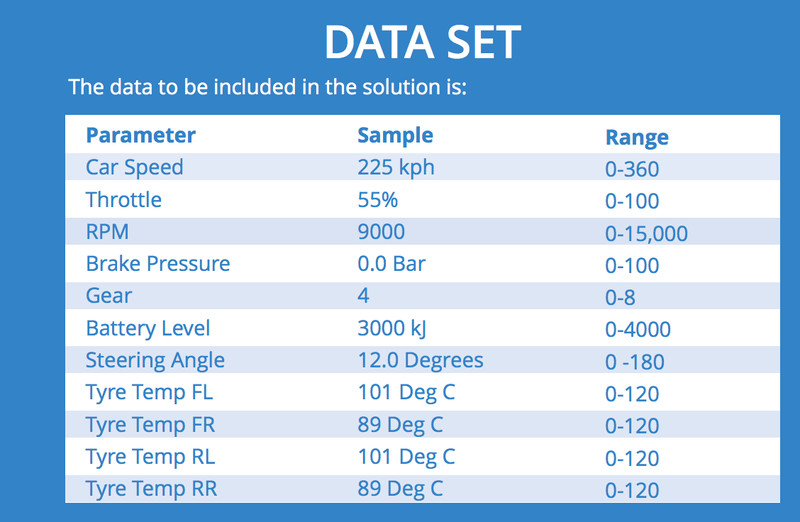 The temperature values are also displayed in an grid to allow for easy comparison, and again are match-colour coded. The steering angle is also displayed as a numerical indicator value, and further emphasised by the Mercedes logo (Mercedes are co-sponsoring the competition, I think? That said, I suspect their brand police, if they are anything like the OU’s, may have something to say about tilting the logo though?!) The battery indicator (CC: “Battery icon” by Aldendino) is grouped with the tyres on the grounds that battery and tyres are both resources that need to be managed. and perhaps also included a note about possible additional channels – hinting at tyre pressure based on the size of each tyre, perhaps, or showing where another grid showing individual tyre pressure might go, or (more likely) assuming a user-interactive display, a push to toggle view, or even a toggling display, that shows tyre pressure or pressure in the same location at different times. There probably also needs to be some sort of indication of brake balance in there too – perhaps a dot that moves around the central grid cross, perhaps connected by a line to the origin of the cross? I’ve never really tried to put a dashboard together… There’s lots to consider, isn’t there?! Previous Previous post: Literate DevOps? Could We Use IPython Notebooks To Build Custom Virtual Machines?